On May 24 Calcasieu Parish Sheriff's Office deputies responded to a business on Highway 14 in Lake Charles in reference to a burglary and theft. 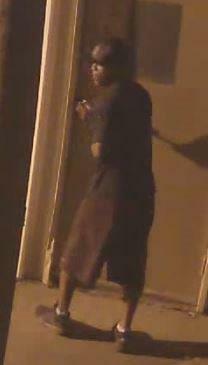 During the investigation detectives reviewed video surveillance from the business and learned on May 23 at approximately midnight an unknown man gained access into the business by entering the back gate of the property and prying the door open with a crowbar. 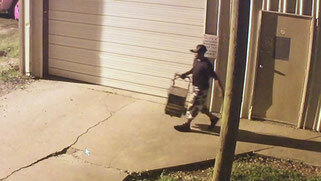 Once inside surveillance showed the man picking up a portable battery charger and exiting the building. On May 25 CPSO deputies responded to the same business again in reference to a burglary and theft. Once detectives reviewed the video surveillance they witnessed the same man return to the business on May 24 at approximately 9:30 p.m. and again at 11:30 p.m. He again entered the back gate and used a screw driver to pry open the door. Once inside he stole a rolling battery charger and a portable air compressor. If anyone has any information regarding this theft or can identify the suspect seen in the photographs or video contact the Calcasieu Parish Sheriff’s Office at 491-3605 or Crime Stoppers at 439-2222.